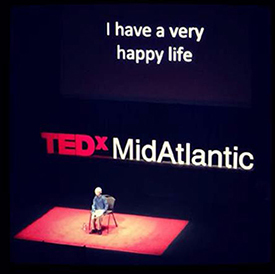 Sam Berns’ Philosophy on How to Live a Happy Life has been viewed by 10 Million people. Out of over 30,000 TEDx talks, his is #2! The tremendous impact the talk has had – and continues to have – on people, and the timelessness of it, are part of Sam’s legacy he has left for all to enjoy. In the wake of this remarkable milestone, The Progeria Research Foundation (PRF) has launched #LiveLikeSam, a 10-day Social Media Campaign to promote greater awareness of the TEDx talk, Progeria and PRF’s work; grow viewership; raise funds; encourage meaningful partnerships; and celebrate Sam’s inspirational philosophy on how to live a happy life. For every action taken, a group of donors will contribute $1 to PRF, up to $50,000. ♦ SHARE YOUR PHILOSOPHY: Tell us “What is your philosophy for a happy life?”, and share your thoughts with social media friends using the hashtag #LiveLikeSam. Post on the PRF Facebook page too! ♦ QUOTE one of Sam’s inspirational messages – here are some of our favorites, lots more to cite!